This spread contains some of the ephemera from the trip to Chichen Itza. I found the background paper on Ebay, and then matched it with a white background for the right hand page. The right hand page has a paper banner that I purchased at a local store, and the green from that drove the rest of the color scheme. The pictures are from a restaurant that we ate at during the trip, and the borders are the same color as the banner. I carried the green theme onto the left page, but matched the borders with the green in the Mexican flag on the page. 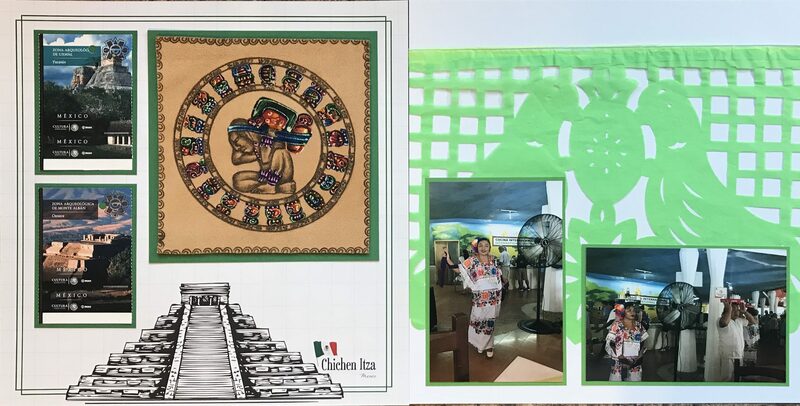 The left page has tickets from our time at Chichen Itza as well as a painting done on leather that I purchased at a local store.